Thursday, Apr. 26, 2018, 6 – 7 p.m.
How can popular education use people’s everyday experience of landscape to illuminate historical struggles and power dynamics? In this talk, Laura Pulido discusses two projects: A People’s Guide, a radical tour guide, and Sangre en la Tierra (Blood in the Soil) a historical atlas. Both projects aim to transform people’s experience and understanding of place as a site of racial history and struggles for social justice. 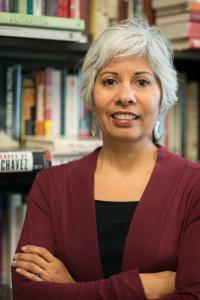 Laura Pulido is professor and head of Ethnic Studies and professor of geography at the University of Oregon. Her current teaching and research focus on white supremacy, environmental justice, landscape, and popular education. She is the author of several books, including Environmentalism and Economic Justice: Two Chicano Struggles in the Southwest (Arizona 1996), Black, Brown, Yellow and Left: Radical Activism in Los Angeles (UC Press 2006), and A People’s Guide to Los Angeles (with Laura Barraclough and Wendy Cheng, UC Press, 2012).